Extract the contents of the zip file into a folder. Run SureLockSetup.msi and Follow the installation steps. Once installation is complete a new shortcut will appear on the desktop and in the Start -> Programs -> SureLock Studio folder. Create New Project either by clicking on File -> New Project or by clicking on the "New" at the top. This is the default tab you are in once you have created a new project successfully. 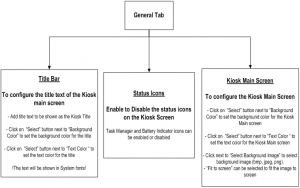 In this screen you can add/delete/edit the information about applications that you want to run on the device in Kiosk mode. 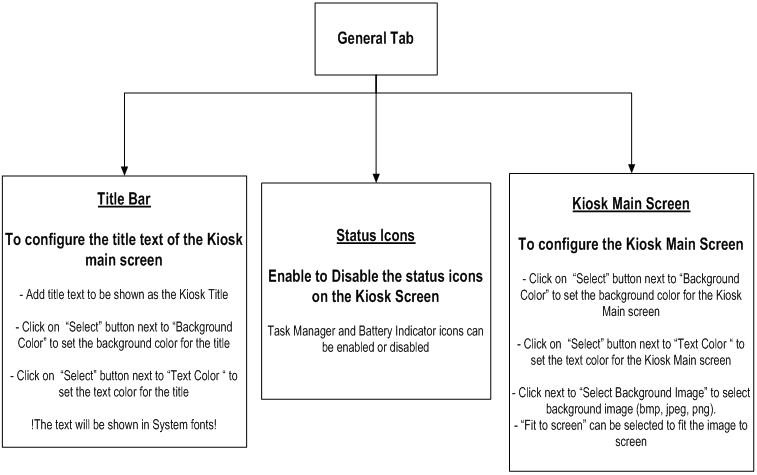 You can also configure the general look and feel of the kiosk main screen on the device. This includes changing various background and text colors. The following flow chart covers the general look and feel functionalities. Once project has been created and required information is saved, the next step is to build the project. Output of the build is a cab file generated in the \results folder on the desktop. The name of the cab file is same as the project name. To build the project, click on Build -> Build Project menu or click the Build Icon on the toolbar. If all information is correct, output folder will be shown. It will contain a cab file with same name as the name of the project. Once a cab file is generated by the building the project, the next step is to deploy or install the cab file to the Windows Mobile device. 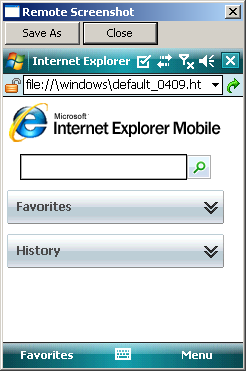 Click on Tools -> Install Cab or Install Cab on Device icon on the toolbar. 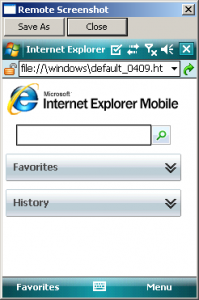 If the Windows Mobile device is connected to the PC via ActiveSync, then the cab file will be installaed immediately. Copy the cab file on to device folder. You can use ActiveSync or Storage Card. Tap on the cab file to install it. Tap 5 times in the empty area on Kiosk Main screen. Admin login screen will popup. Enter the password and tap OK.
Device will get unlocked and full access to device functionality will be available. Note: Make sure that the device is connected to the PC over ActiveSync before using Remote Manager. Retrive information about active window on the device. Click the Remote Window button. Information includes: Path of the owner application, Window Title and Class name. Remotely reset the device. Click the Reset Device button. Connection with the desktop will be lost as the device resets. You must close Remote Manager and launch it again before using any other options. Configure the device security settings for RAPI (Remote API). 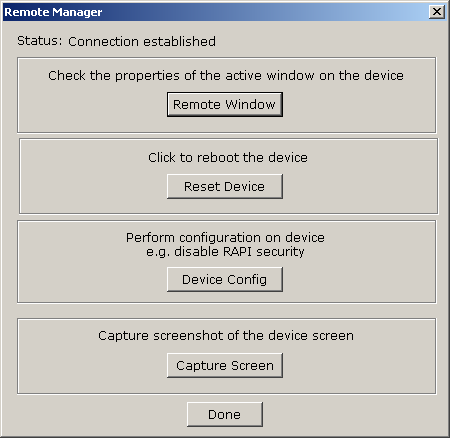 Click the Device Config button on the Remote Manager window. 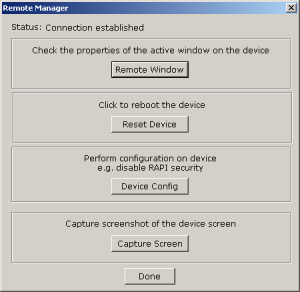 Use this to disable RAPI security on the device before using other features of Remote Manager. Note: You need to disable RAPI security only if other features don't work. Capture device screenshots. You use this to send us the screenshots of the device in case SureLock is visually not working as expected. If SureLock is up and running on the device, there are multiple ways to install the updates. Manual update is applicable if device is physically available. Unlock the device by entering the administrator code. Read this for information on how to unlock the device. Connect the unlocked device to the desktop and setup ActiveSync connection. 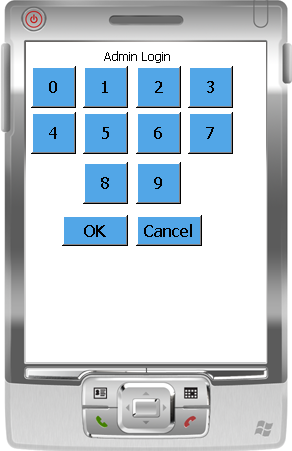 Copy the new SureLock cab to a folder on the device or on the storage card. Once the cab file is copied, tap on it for installation. After installation in complete, reset the device to start SureLock again or go to Start -> Programs and tap on SureLockClient icon. If SureLock is already running on the device, then new cab installation will fail or corrupt the settings. Launch SureLock Studio and open the project file. Click on Tool -> Create PreUpdate Module to generate PreUpdate.exe by entering the older administrator code. Remotely deploy and run the PreUpdate.exe file on the device. This will unlock the device. Note: PreUpdate.exe contains unlock code for the existing SureLock configuration. This file should be deleted immediately by the installation script or procedure. As soon as PreUpdate unlocks the device, install the new SureLock cab. After the SureLock cab is installed, reset the device remotely. After reset the device will start in kiosk mode again. If the device is in kiosk mode, it has to be unlocked first. Refer to previous post for information on how to unlock the device. Once the device is unlocked, go to Start -> Settings -> Remove Programs, select 42Gears SureLock from the list and remove it from the device.